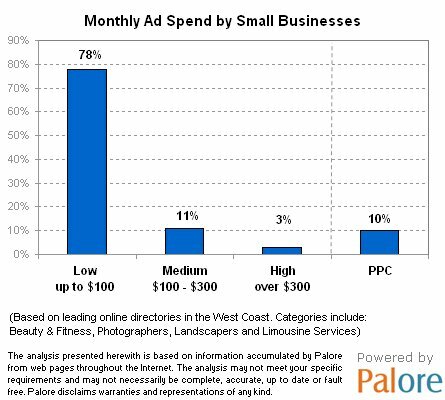 Below is a nice chart from Palore, representing over 6,000 businesses found on leading online directories. Categories selected were beauty & fitness, photographers, landscapers and limousine services, for the LA and San Francisco area. Small businesses are spending very little on-line, too little on-line. It takes money to make money folks! Do you know what those numbers are hidding? The fact that it’s representing only a few high potential industries in the local web marketspace. Those that tend to see high levels of internet traffic for local services. So if these are the businesses that are spending money, and little at that, what’s the rest of the local market doing? Not much. Nice point Stever. I would agree that a lot of local businesses are not doing much when they should or could.